It is super to have todays guest on the show, as he is quite simply the nearest to a real life superman that I have ever spoken to. He is a man on a mission, and it is a mission that will take him around the world and inspire the world at the same time. 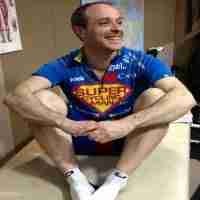 Starting in April 2015 and finishing in January 2020, he is going to try to complete a record-breaking 7 Continents Round the World Cycle ride, whilst wearing a superman costume? You can only imagine how sore parts of his body are going to be on this epic adventure! His cycling adventures actually started way back in 2011, when he cycled 4,000km from his home in Tooting to Turkey, raising over £5,000 for charity but this was literally just a “Hey honey I’m just going for a ride on the bike for awhile!” kind of trip in comparison. Now he is working his way up to the kind of fitness, to tackle head on this amazing trip and on the way aim to raise £100,000 towards the World Cancer Research Fund and Parkinson’s UK. But like so many inspiring tales of achievement and extreme effort that we hear on Join Up Dots, more often than not its the smaller ripples that make for lasting change in the world. Our guest teaches year one children at Brandlehow Primary School in Putney, and is also the Healthy Schools Coordinator for his school. I’m sure he is going to do just that too. So what is it about cycling that so appeals, as it is renown as being one of the hardest form of long distance endurance? And how has he managed to get so much time away from school, he can’t go with the “Oh its a teacher training day” after all? Well lets find out as we bring onto the show to start joining up dots, the Super cycling man himself, Mr Will Hodson. How he feels passionately that we should have micro adventures and challenge ourselves on a daily basis, no matter how small the difference is they all add up. How he believes that the world is 99% a happy friendly place where people are caring for each other, no matter where you come from or look ike. Why it is so important to have many streams of income coming into your life if you want to live the life of your dreams. Why we should forget the big picture as it is too scary to comprehend, and instead just start working on breaking everything down into small chunks. Why he thinks that Pharrell Williams, classic tune “Happy” should be the theme tune of his life, as he loves the thought of making the world smile everyday.